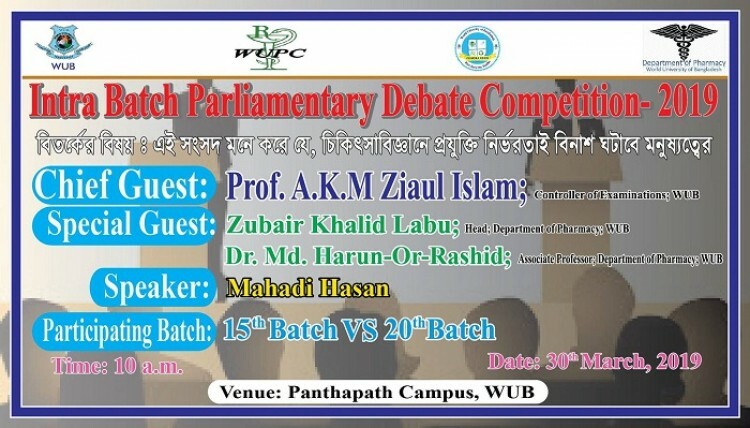 Department of Pharmacy, WUB is going to arrange an intra departmental Debate Competition on 30th march 2019. Prof. AKM Ziaul Islam, Controller of Examinations, WUB has given his concent to present as chief guest. Zubair Khalid Labu, Head, Department of Pharmacy and Dr. Md. Harun-Or-Rashid, Associate Professor, Department of Pharmacy will be present as Special Guest.